Just because you’re missing teeth doesn’t mean you have to miss out on the fun things in life. You can get back to enjoying things like eating your favorite foods and smiling and talking with ease again with the help of dental implants. At Studio Smiles NYC, we can complete the entire dental implants process here in our office. No need to venture out to a specialist! Let us help you reclaim your smile. In place of missing teeth, we can place small titanium posts called dental implants. These implants basically function as a replacement root for a tooth that has fallen out or been extracted. The titanium fuses with your jaw bone to create a solid and secure anchor for a restoration. The type of restoration we place depends on how many teeth you need to replace. Dental crowns are ideal for replacing a single missing tooth. Dental bridges can replace a few missing teeth in a row. Dentures supported by implants are great for patients missing most or all teeth, and they’re more secure than traditional dentures. Before we begin, we like to bring patients in for a consultation to go over their specific dental implant needs. This is also when we take X-rays and images to use for planning your treatment. During your consultation, we go over your restoration options – a crown, a bridge, or dentures – and your estimated costs. We don’t want anything to be a surprise to you! The number of appointments required for the placement of your implants depends on your unique needs. If we need to extract a tooth first, we can do that here in our office. We can also perform a bone graft if we feel like your jaw bone can’t handle a dental implant. At your first implant appointment, we place the titanium posts into your jaw bone. Don’t worry, though, we make sure you’re comfortable throughout the surgery. Once the posts are placed, you need to let the area heal for a few months and give the titanium time to fuse with your jaw bone. Then we bring you back to have your restoration placed and your smile completed! When properly cared for, dental implants can last a lifetime! Just brush and floss as you normally would and make sure to keep up with regular appointments at our Manhattan dental office. Implants are more secure and stay in place better than dentures alone. The adhesives used in dentures sometimes don’t hold the appliance in place as well as you would like. With implants, we can secure your denture in place so it doesn’t slip or click anymore! You can eat all your favorite foods again knowing that your teeth will stay in place. That depends on your needs. 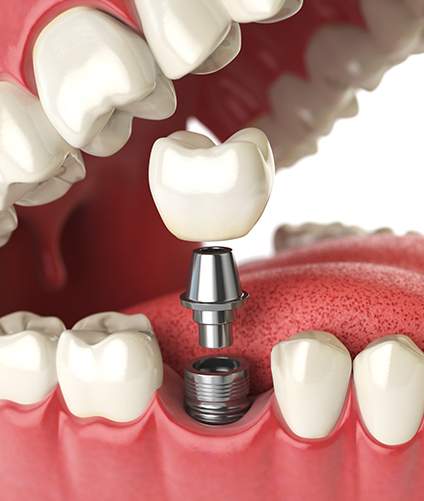 A single tooth implant is less expensive than multiple implants to support dentures. We go over all your expected costs at your consultation, and we discuss your payment options so you can make the best decision for your budget.